We haven’t quite had our fill of cranberries yet, and the stores still have some packages of fresh cranberries. 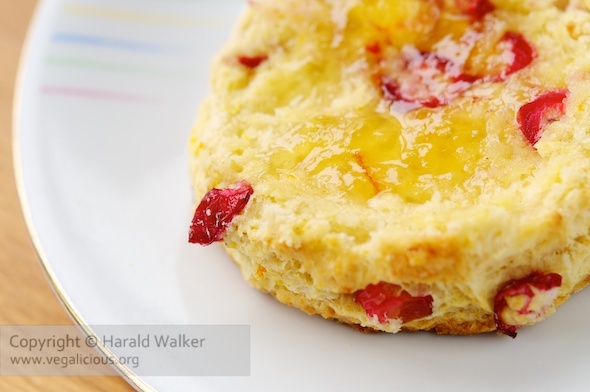 These flavorful biscuits or scones were really delicious, using only fresh orange juice to moisten the dough. Place the flour, baking powder, sugar, cinnamon if using and salt in a large bowl. Add the vegan margarine and blend with a fork or your fingers to a lightly sandy consistency. Pre-heat the oven to 400 F / 204 C.
Add the chopped cranberries and zest and mix lightly. Add the orange juice and mix until the dough is just moistened. Turn the dough out onto a lightly floured workspace and fold over to evenly blend. Fold only 3 or 4 times, as overworking the dough will make it less light and fluffy. Pat the dough out to a flat thickness of 1/4 – 1/2 inch. 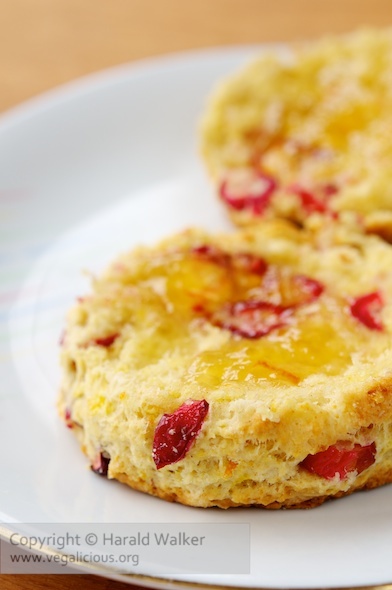 Using a floured cookie cutter or juice glass, cut 6-7 medium biscuits. Place on a cookie sheet prepared with baking parchment. Bake it in the oven for 15- 18 minutes until lightly golden brown. Remove from the oven and enjoy warm. We used just under a 1/2 cup of freshly squeezed orange juice. It was one large orange. Posted by Chris Walker on January 28, 2011 in Breads and Muffins, Breakfast, Cranberry, Orange.